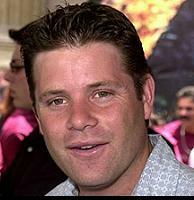 Biography: Sean Astin made his feature film debut (at age 13) as "Mikey Walsh" in Richard Donner's adventure The Goonies (1984). Sean's portrayal of a young man determined to play football for Notre Dame in Rudy (1993) won hearts across America, and continues to inspire young people whenever it is shown. Other well-known film credits include Bulworth, Courage Under Fire, Memphis Belle, Encino Man, Like Father Like Son, Where the Day Takes You, Staying Together, War of the Roses, Safe Passage, and White Water Summer. Sean received Best Actor honors for his performance in Low Life at the Fort Lauderdale Film Festival. He can also be seen in the indie releases Deterrence, Kimberly, The Last Producer and Boy Meets Girl. A promising director, Astin garnered an Academy Award nomination for his short film Kangaroo Court, which he also co-produced with his wife, Christine. A Directors Guild of America member, Astin also directed an episode of the HBO anthology series Perversions of Science. • "The Lord of the Rings was just so much enjoyment. It was over about the space of a year that I was filming. It's one of the most enjoyable things I've ever done...so emotional."